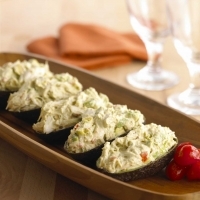 Our fresh and delicious Crab and Avocado Salad is perfect as an appetizer or a lovely lunch. The spice of the pepper medley and the cool creaminess of the avocado create a perfect balance of flavor! 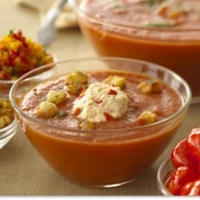 In medium stainless steel or glass bowl combine the cheese, tomato, lime juice and curry powder. Mix well. Split avocado in half, remove pit, dice and reserve the shell. Fold in diced avocado and season with salt and pepper to taste. Gently fold in crab meat. Fill Avocado halves with the salad and place on serving platter. Serve with crackers as a dip or with your favorite sandwich bread. I made this for a friend's baby shower (she's been craving crab) and it was a huge hit. Only I stuffed the crab in larger cherry tomatoes as an appetizer. Thanks for the great recipe! @Chuckieb....I live in the states and haven't heard of the Sweet and Spicy pepper variety of Alouette either! By my GR name, you can tell I'm a crab fan.....and I want to try this recipe! On the lookout for the cheese to make it! This looks absolutely scrumptious. I love your products and use them frequently. Keep the great recipes coming. This sounds and looks amazing! I have never ever heard of Alouette Sweet and Spicy Pepper Medley. Am guessing it's only in the States and not here in Canada. Is it like a soup mix or a dressing mix or something that I might be able to substitue? Like corrinnej's recipes? Never miss an upload!